Residents try to help first responders move their vehicle. A lot of attention has been focused on how unprepared the city of New York was in handling the blizzard that literally brought the world's greatest city to a standstill. Mayor Michael Bloomberg has been skewered for being flippant about the city's failure to respond to the needs of residents and has replaced his arrogant tone with a contrite one. Inconvenience turned to death and despair as stories poured in about tragedies experienced because of the failure to properly deal with the snowstorm, the Daily News reported. A blizzard baby delivered inside the lobby of a snowbound Brooklyn building died after an emergency call about a woman in labor brought no help for nine excruciating hours. The baby's mother, a 22-year-old college senior, was recovering Tuesday night at Interfaith Medical Center, where her newborn was pronounced dead at 6:34 p.m. on Monday. That was 10 hours after the first 911 call from the bloody vestibule on Brooklyn Ave. in Crown Heights. "No one could get to her. 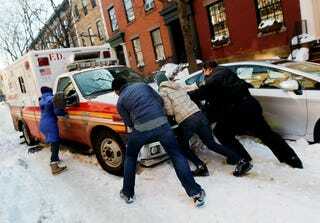 Crown Heights was not plowed, and no medical aid came for hours," said the student's mother. In Queens, a woman tried to reach 911 operators for 20 minutes Monday and then waited for three hours for first responders to arrive. By then her mom had died, State Sen. Jose Peralta's office said. Laura Freeman, 41, said that her mother, Yvonne Freeman, 75, woke her at 8 a.m. because she was having trouble breathing. When the daughter couldn't get through to 911, she enlisted neighbors and relatives, who also began calling. One of the callers reached an operator at 8:20 a.m., but responders stymied by snow-clogged streets didn't reach the Corona home until 11:05 a.m., said Peralta, who wants the death investigated. A woman in Sunset Park, Brooklyn, was forced to spend the night with her dead father after the medical examiner's office took more than 24 hours to claim his body. Ismael Vazquez died at 10:31 a.m. on Monday, and the 82-year-old man's body remained in his bed until 1 p.m. yesterday. His daughter kept vigil in the living room. We could go on, but we'll stop. These are the real consequences of a failure to respond to the basic needs of residents after a snowstorm hits, like snow removal. Truly tragic.